NOTE Interior of Helmet shown above: Owner’s name “Schmidlke” in script print & the more recent drawstring replacement. In consideration of the drawbacks of the current steel helmet (hindrances to sight and hearing while slighting, shooting and operating optical devices) a new helmet model was developed and it has proved to be practical in tests by training and research personnel. Field trials are completed. The improved model has been designated as the Stahlhelm 35 and it will replace the helmet which up until this time was used by both mounted and unmounted troops. The new helmet has no ear cutouts nor ventilation lugs. It has a somewhat higher visor; the visor, sides and neck apron are somewhat shortened. Test results, descriptions and instructions for adjusting and wearing the helmet will be issued at a later date. 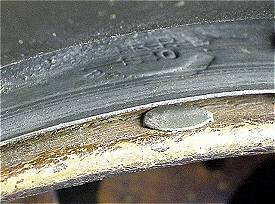 The allowable duration of wear remains the same. The previous helmet sizes (60, 62, 64, 66, and 68) will be retained. Intermediate sizes (61,63, 65, and 67) will be achieved by variation of the liner. As of 1 July 1935, new requisitions will be filled with Model 35 helmets. These requisitions are to be forwarded without delay from the Army Clothing Offices to the Procurement Office. The Model 31 liner system remains unaltered. Those existing helmets which are now in use are to be replaced by the Model 35 helmet and will be disposed of at a later date. Dispositions about the functionality evaluation in the field trials of the vulcanized rubber helmet are the concern of the regional defense districts. The helmet is formed from sheet steel between 1.1 and 1.2 mm thick. At no point is the thickness less than 0.95 mm. It is seamlessly stamped and the entire rim is crimped inwardly to a width of about 5 mm. The size of the helmet is so measured that the entire inside surface stands away 20 mm from the wearer’s head. Holes to accommodate the liner- retaining rivets are located at the rear center of the helmet and on each forward side, slightly ahead of each temple. On each side are also openings for the insertion of the ventilation bushings. The lower portion of the helmet extends outward at the sides and rear to form a throat (sic) and neck apron. The edge of the apron is horizontal so that the helmet sits in a level manner when it is placed on an eve surface. The helmet is coated inside and out with a rust-proofing grey-blue paint. The army uses a matte grey paint. Applied three millimeters under the ventilation holes are: a) on the right side, a shield-shaped device in the Reich’s colors (black/white/red), and b) on the left side, the service insigne of the Luftwaffe in a silver-grey color (for generals, technicians and officials of general rank a gold colored insigne). The central axis of the insigne must fall exactly in the center of the ventilation hole and must be perpendicular to the rim of the helmet. The shield 3.3 cm wide and 4 cm high. The colors must be weatherproof. The helmet is manufactured in five sizes: 60, 62, 64, 66 and 68. This means that the inner circumference of the helmet at the point where the dome meets the apron is the measured size. The intermediate sizes are achieved by variations in the size of the liner. The helmet provides protection against shrapnel and small grenade fragments. This was demonstrated by experience during the last war. The helmet’s weight and method of positioning are extremely important and are directly related to its ballistic integrity. All of these weights are measured without the liner and chinstrap. Size marking painted on transitional helmet. These intermediate sizes are achieved through variance of the liner. The visor should be aligned with the eyebrows. For a correctly fitting helmet, the proper helmet size must be selected to insure that the correct size for the head is obtained. A gap must exist between the head and the leather liner so that, if the helmet is dented by impact, head injury is circumvented. The helmet’s ventilation is achieved by ventilation openings on each side of the helmet. The application of insignia other than the authorized service insignia and national color shield is forbidden.In peacetime, the use of grass, twigs, etc. for camouflage may only be authorized by the commanding officer. Smearing the helmet with clay, soil, and so forth is forbidden. In the field (under combat conditions), all possibilities for camouflage are encouraged. If the chinstrap is not worn under the chin, it is to be placed around the top of the visor. Misuse of the helmet (e.g. cooking in it) is forbidden. The metal loses its tempering and Ballistic integrity when it is subjected to heat. If the surface paint is damaged, it must be touched up or totally repainted as soon as possible in order to prevent the formation of rust. Polishing, lacquering, or smearing the helmet with grease is forbidden. By doing this, the helmet loses its matte, glare-free finish. Simple repairs to the helmet are to be carried out by the unit armorer. For repairs to liner, troops are advised to take the helmet to the unit leatherworker. During warehouse storage, extra helmets are to be stacked with a sheet of paper between each so that the surfaces will not be damaged. These stacked helmets are not to exceed five high. The three-part rivet and washer are manufactured from brass sheeting and are then zinc- coated by galvanization. The head of the rivet is rounded and lacquered in a blue-grey color. The color of the rivet head must correspond as closely as possible to the color of the helmet. 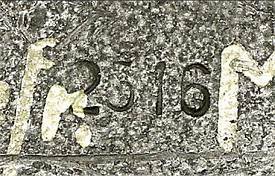 The rivet is stamped on the flat side of the shank with the company stamp and the year of manufacture. The rivets are packed in such a way that the painted heads are not damaged. The name of the manufacturer is to appear on the cardboard packing box. A near mint example of a galvanized banded helmet liner (SE Model 1940 M-40 steel helmet) and drawstring. 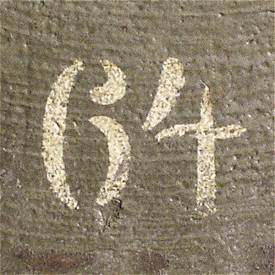 Note the stitching through the tongue and the round, encircled “59” ink stamp. Size 66 shells would fit either a size “58” or “59” liner. Outer ring: light metal (aluminum-magnesium alloy) in accordance with production number 12 240. Inner ring: light metal (aluminum-silicon-magnesium alloy) in accordance with production number 12 240. Springs: made of the best spring steel. The scratch-resistant lacquer must be baked on the surface. Hanging loops with rings: light metal (aluminum-silicon-magnesium alloy) in accordance with production number 12 240, sand polished. Rivets and attachment pins: aluminum-silicon-magnesium alloy in accordance with production number 12 240. Leather lining: split or unsplit sheep or goat leather must be tanned with plant agents, although the use of synthetic tanning agents in conjunction is also permitted. Sumach tanning chemicals for post-treatment are permitted. Mineral tanning agents are prohibited. The ash content of the leather may not exceed 6% and the total rinsing loss, 7%. The fat content of the leather must fall between 3% and 8%. The leather’s free fatty acid content (calculated as oleic acid) must not exceed 2%. The leather must be free from strongly acting free acids and any chemicals that may be hazardous to health (for example, soluble synthetic tanning agents, cellulose extracts, etc.). Only leather may be used in the production of the sweat lining. This leather is to be released for processing only after close examination. Felt strip: made of uncolored sheep wool (30% mixture), but without the addition of any plant fibres. The felt must be shrink-resistant and mothproof. Drawstring: made of cotton with a 20% cotton admixture. The tensile strength is 11 kg at a 30 cm segment length. Sewing thread: The thread used for stitching the leather lining and felt strip is machine linen thread No. 30/3 metric (50/3 English); for the closing seam of the leather liner, machine linen thread No. 10/3 metric (18/3 English) is used. behind the right hanging loop – the manufacturer’s name and the year of production. behind the left hanging loop – the helmet size and the corresponding head size. A two-piece strap made of natural leather, the outside of which has been grained and dyed a chocolate color. The short strap has at one end a single pronged, double bar buckle that is attached to the leather strap with two rows of stitches (eight stitches per row). On the other end are two pear-shaped buttonholes for the insertion of the double-ended button. The long strap has at one end 13 holes in a row for adjustment and at the other end, the two pear-shaped buttonholes. The chinstrap buckle is a single pronged type; the prong has a slight curvature. 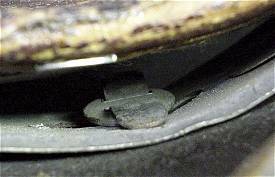 The tip of the prong is flattened and rests against the lower bar of the buckle, but cannot pass beyond it. The double button is the same on both sides and each end is circular with a very small radius. The outer surface of each end is slightly domed. Positioning: Both straps are inserted through the hanging loops from the inside to the outside buttonhole end first. The double button then secures the end of the strap to the hanging loop. The buckle is normally worn on the left side of the face, except by left-handed shooters who are to reverse it to the right side. Material: the straps are made of the best grained leather. Both leather and coloring must be acid free. The buckle and double-ended buttons are made of aluminum in accordance with DIN (German industrial Standard) 1713, Group 4, hardened and then sand-polished. Initially helmets were produced by the Eisen-und HÃ¼ttenwerke, Thale, and the SÃ¤chsische Emaillier-und Stanzwereke, A.G., Lauter. Later, three more companies were included in the production of German helmets: F.W. Quist, Esslingen; Emaillirwerk A.G., Fulda; and Vereinigte Deutsche Nickelwerke A.G., Schwerte/Ruhr. Liners were produced by Schuberth-Werk, Braunschweig; Biedermann u. Czarnikow, Berlin; F.W. MÃ¼ller Jr., Berlin; Werner Zahn, Berlin; Biedermann und Czarnikow, Litzmannstadt and Karl Heisler, Berlin. By examining surviving specimens, it is not difficult to identify the helmet producers based on their abbreviations found inside the helmet shell. 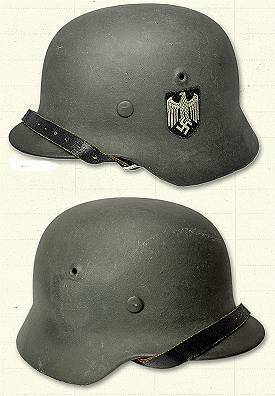 According to remaining records, approximately 25 million German helmets were produced from 1935 to the end of the war. Due to the high number of head wounds experience in 1914-15, the German High Command authorized the development of a steel helmet. In December 1915, military physician Friedrick Schwerd and professor August Bier of the Technical Institute of Hanover developed a prototype for field trials. The helmet was fabricated with high quality chromium-nickel steel and featured a visor and sloping skirt which protected the wearer’s neck and ears. The design offered far more protection than designs chosen by the opposing British and French forces. One notable feature of the design are two raised “horns” or Stirmpanzer lugs set on each side of the helmet. These lugs were deigned with the due purpose of ventilation and to accommodate a removable sentries’ steel brow plate or Stirmpanzer. The brow plate proved to be impractical and was rarely used in combat. The newly designed steel helmet was issued to the 1st Assault battalion that same month. The field trial proved so successful that Chief of Staff, General Von Falkenhayn authorized the issue of steel helmets. The first delivery was made in January of 1916. 30,000 of these helmets were sent to the Verdun front. Distribution to the rest of the Imperial forces continued slowly through the rest of 1916 though April of 1917. Early production M16 helmets are known to collectors as “square dips”; due to the way the flare in the skirt dips in a square shape from the bill to the skirt. Engineers at the Eisenhüttenwerk plant (where these early helmets were produced) ended up modifying the design slightly due to the fact that during the manufacturing process the helmet’s skirt would often crack. A good many “square dip” helmets did pass inspection however and photos show them worn though-out the war. 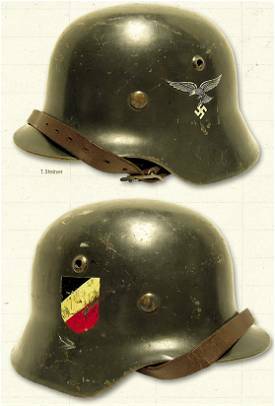 Each German helmet is marked on the flange with a manufacture mark and size stamp. Helmets were produced in sizes 60-70. There are at least 14 known manufactures. The inside dome of the helmet is also marked with a code known as a “heating lot number” This number was to aid in quality control at the factory level. In some cases it may indicate where the helmet’s steel was rolled. It is believed that more then 7 million helmets were produced during the period of 1916-1918. The largest share of these helmets was produced by Eisenhüttenwerk, Thale, AG, F.C. Bellinger, Fulda, and Eisenhuette Silesia, Paruschowitz Oberschlesien. These factories are known today by collectors as “the big three”. The German military went to great lengths to insure quality control of their helmets. Contemporary records dating to June of 1916, show one helmet out of a lot of 101 was tested for steel integrity on the rifle range during ballistic testing – multiple shots at a distance of 40 meters using an antiquated black powder 1871 11mm Mauser. If the inward dent exceeded 2mm or other failure occurred, a further 5 helmets from the lot were to be tested. If these failed, the lot was scrapped and the steel mill which supplied the ingot was required to overtake the costs for scrapping them. During the final acceptance, each helmet was inspected in-plant by a quality control team made up of an Officer, NCO and a few Enlisted Men known as Abnahmekommando. Prior to the installation of the liner, attention was given to weight, dimensions and paint adherence in addition to structural soundness of the shell. Each helmet that passed inspection was marked with an ink stamp made from a conjoined AK (for Abnahmekommando) on the inside rear flange by the acceptance officer. Helmets that didn’t pass were scrapped. Great care was taken to make sure no flawed helmet left the factory. Helmets were painted at the factory with smooth low-gloss linseed oil based enamel paint. The color was designated as “field-gray”. The term field gray can be somewhat confusing as original helmets vary greatly in color. The official war department authorized formula was, 30% white pigment in an oil base, 15% ochre pigment (dry), 5% blue pigment (dry), 5% black pigment (dry) 20% turpentine, 10% siccative and 15% water. Yet original helmet paint can range from dark green to olive. Although some shades appear to be factory specific, it is not uncommon to find helmets produced at the same factory which exhibit variations in field gray. Color matching was not an exact science at the time which may explain the variation in shades of field gray. Despite the variation in color it should not be assumed that any shade of gray-green is correct. 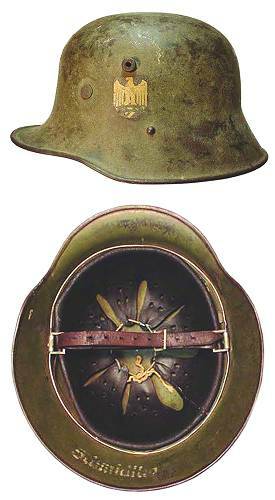 WWI produced German helmets differ greatly in color from their Reichswehr and Wehrmacht counterparts. To the writer knowledge there is no modern commercial available paint which comes close to colors found on original WWI produced German helmets. There is often some confusion between the designation M16 and M17. The designation actually does not refer to the helmet at all, but to the liner. German helmets produced between January of 1916 and May of 1917 are fit with an all leather liner. The M16 liner consists of three individual 2-finger pads sewn to a leather band. Each pad has a cloth pocket with ties sewn onto the back. The pocket is designed to accommodate horse hair or gauze “pillow” which would allow for a more snug fit to the wearer’s head. The pillows could also be removed to allow for a larger head size. In May of 1917 due to a leather shortage the liner was redesigned. The new liner continued with the earlier “three pad” system but changed from a leather band to a steel band made from sheet metal. The pads were now crimped into place on a steel band. Another changed was made to the liner as well. The pads were now to be made from white chromed leather (Russian leather) instead of brown vegetable tanned leather. This change was made in hopes that the chromed leather would hold up better under the constant moister of the trenches. That being said large numbers of brown vegetable tanned pads had been produced and it is not uncommon to find these pads on both M17 and M18 liners. M17 liner pads are sometimes found made from non-standard leather and backed with non-standard cloth. As the cost of war continued to plague the Germans ersatz materials were often substituted. M17 pads are found made from rabbit, goat, and sheep and on rare occasions pig skins. Corse burlap was often substituted for the pad backing when cotton and linen where not available. There is some debate among collectors as to when and if production of the older M16 liners ceased. Original helmets are occasionally found with M16 liners bearing 1917 dated manufacture and or depot stamps. Whether these helmets are the result of being produced before May of 1917 or possibly were refit at the depot level with recycled M16 liner is almost impossible to know with any degree of certainty. It maybe possible that a few manufactures continued to fabricate M16 liners after the design was modified. 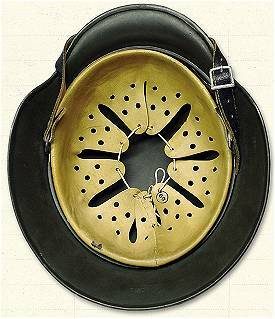 The liners were designed to be secured into the helmet with three separate pronged pins, known as split pins. The head of each pin was welded onto two prongs. When the liner was installed the prongs were bent in opposite directions thus securing the liner into place. The front two pins are the same in design and size. The head of the rear pin is slightly thicker. The thicker head pin was designed to keep the Stirmpanzer (sentry brow plate) strap when worn from slipping off the helmet. With the introduction of the M17 liner the split pins were redesigned as well. The newer M17 pins had slightly shorter, but wider prongs then the here to fore mentioned M16 version. This design functioned more effectively and allowed a tighter or secure fit on the steel liner band then the M16 version. However M17 liner are often found secured with the early pattern split pins. During the M16 helmet design phase one critical aspect was over looked, the need for a chinstrap. It was initially felt by the designers that due to the overall weight of the helmet a chinstrap was unnecessary. However in the finally design phase it was realized a chinstrap would be needed. The solution was to rivet M91 Pickelhaube posts to each side of the helmet’s skirt. The design would accommodate the chinstrap already being worn on the Pickelhaube, thus eliminating the need to design and fabricate a new chinstrap. The helmets were issued without a chinstrap and it was up to the individual soldier to remove the chinstrap from his Pickelhaube to his newly issued steel helmet. This design proved to be problematic. The soldiers found the design to be uncomfortable due to the fact the strap was worn fairly far back on the chin and often hit the wearers wind pipe. The M91 posts also proved to be poor fits for the chinstrap hooks, with chinstrap often falling off at all the wrong times. Soldiers found ingenious ways of keeping the hooks secured in place. Original helmets are sometimes found with bits of wire twisted round the post to keep the hook secured into place. Some frustrated soldiers even went as far to ping the M91 post, thus mushrooming the steel enough to keep the chinstrap hook secured. The M91 chinstrap itself when though a number of changes though the course of the war. Pre-war/ early war chinstraps feature brass hardware with brown or blackened leather. By 1915 due to the strategic nature of brass the high command ordered a switch from brass hardware to nickel and enameled steel then finally to bare steel. The strap itself changed as the war progressed as well. Earlier model straps have the hardware sewn into place; by 1917 hardware was often riveted. Like the liners there are also a number of ersatz chinstrap versions. In 1915 a field gray leather chinstrap was produced in limited numbers for use on the field gray felt Pickelhaube. Some of these field gray straps found there way onto steel helmets. Sometimes original M16/17 helmets as well as Pickelhaube are found with a strap made from cloth webbing. 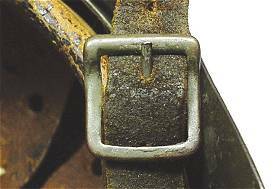 Not much is known about these unusual straps and it is provable that they were produced at the depot level from recycled hardware when leather was unavailable. Originals are typically found void of maker or issue stamps giving some credence to this theory. In some cases the webbing appear to be British, making it possible that these straps were made from captured material. Regardless the number of surviving examples found on combat worn helmets does show they were used. The chinstrap issued finally proved to be problematic enough that the high command finally authorized a new design. On July 15 of 1918 a newly deigned helmet was put into production. Although almost identical in appearance the new M18 did away with the ineffective the M91 chinstrap posts utilized a new chinstrap delivery system. The new design called for the M17 liner band to be modified by riveting swivel ring bails onto each side. A new chinstrap was also designed to be worn with this new system. The new chinstrap design incorporated a sprung hook or carbine clip attached to one end the other end being preeminently secured to the other bail. Original M18 chinstrap are found riveted or sewn into place. Only six factories are known to have produced the M18 helmet. Its unknown if the remaining factories continued to produce M17 helmets after the high command authorized the design change. Due to complaints from soldiers that the low skirt of the helmet inhibited hearing another design change was proposed. A new prototype was sent for field trials in August of 1918. This new design modified the skirt at the lower edge of the helmet in an upward dip below the Stirmpanzer lugs. Today this model is known as the M18 cut-out, telephone talker’s or Cavalry helmet. The later terms have no validity as the design was meant for all troops, and not just to those who used the telephone or served in Calvary units. A change was also made in the type of paint which would be used on these helmets. A new paint known as Wollstaub had crushed wool felt mixed into it to produce a rough textured lusterless finish. The hope was this finish would reduce the glare on the helmet’s surface. All told 100,000 M18 cut-out helmets all in size 64 were by the Eisenhüttenwerk factory during the final months of the war. The design proved to be extremely popular with the men at the front and had the war continued it is possible that the new design would have become the standard helmet of the Imperial forces. No discussion on German helmets can be complete without touching on camouflage. The smooth factory finish on the helmets reflected the sun’s glare making a tempting target for the enemy. To make matters worse individual soldiers took to the practice of polishing their helmets with motor oil to a high gloss for inspection. Early techniques to camouflage were to smear the helmet with mud which effectively hid all traces of a glossy finish. In January of 1917 the war ministry authorized the testing of white colored canvas helmet covers which were to be issued to troops in snowy regions of the front. On February 14th of 1917 the war ministry also authorized the production of earth and field gray colored canvas helmet covers. Some discussion was made between High Command and the General Supply Offices as to whether these covers were to be worn strictly by sentries and patrols or were all soldiers to be issued with such a cover. It appears no decision was ever made, but contemporary records indicate 800,000 covers were issued. As is often the case soldiers found their own ingenious ways to camouflage their helmets. Some men cut up old sand bags and shaped the burlap over the dome of the helmet, then with section of bailing wire secured the cloth to the helmet. Original photos as well as surviving helmets attest to a variety of methods used. The earliest account of helmets painted in camo colors only dates back to June 13 1918, referring to trials that had been carried out by 6th Bavarian Landwehr Division, who painted their helmets a dot pattern camo. After the trial proved successful and the directive was issued the practice spread to the rest of the army. It should not be assumed however that the every unit took part in the directive, as there are plenty of original photos taken in November of 1918 showing German soldiers wearing plain field gray helmets. Today collectors have identified several variations of camouflage patterns found on original helmets. They are known as tortoise shell, stained glass, window pain, blotch or splotch and lozenge camo. It is probably that depots and individual soldier painted their helmets with patterns that matched their particular skill set, which may explain the numerous patterns. Although the Ludendorf directive was clear on which colors were to be used variations exists on original helmets. This maybe the result of the availability of certain colors at the front to the need to choose colors which blended into the setting where the individual found himself. 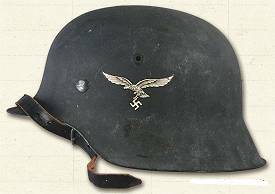 Original helmets found having document service on the Italian front have been known to feature hues of blue, stone gray and white, colors which would have blended in well in the alpine stetting. In conclusion attesting the superior protection offered by the M16 and both M18 model helmets, these helmets continued to be worn long after the end of WWI. Both models would see future service with slight modifications in the Reichwehr as well as in Hitler’s armed forces during WWII. Many were even purchased by foreign nations after the war and were worn well it the 1970s. The design also served as the basis for future German steel helmets, and its influence can even be seen today on the Kevlar helmets worn by U.S. and NATO troops.